Hi Loves! 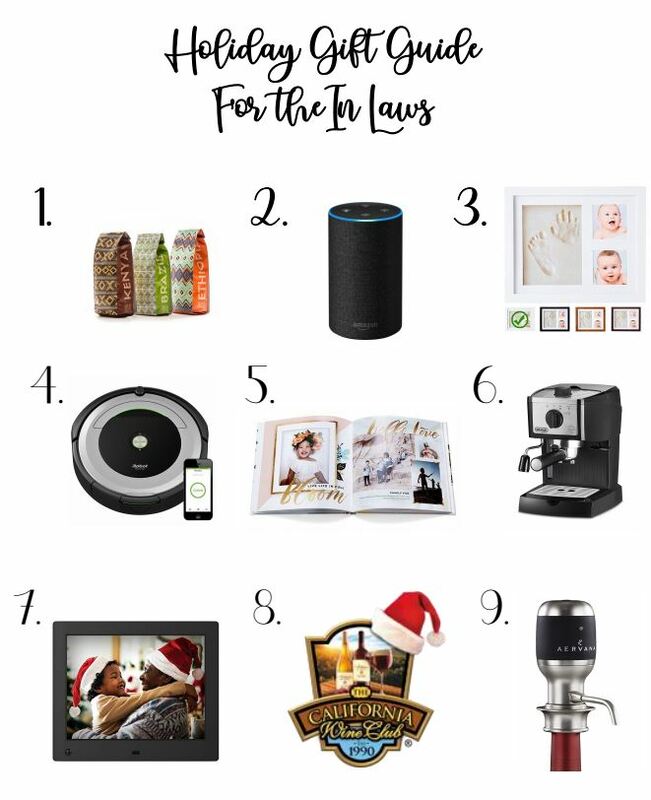 Here are my FAVORITE gifts for the in laws or parents in your life. All of these gifts can be found from the links below as they are all from different online sites. You cannot go wrong with these choices. I hope you guys love! SHOP SHOP SHOP! The Christmas rush is on. I hope you guys enjoy my Gift Guide For The In Laws. Please check out my other gift guides if you are still looking for ideas for the Hubs or for the Hostess With The Mostess. 1. Atlas Coffee Club: This coffee club is amazing and it is the perfect gift for the coffee lover. You can customize this coffee gift any way you would live. They have coffees from all over the world. They can receive a fresh new bag every 2 weeks or once a month. 2. Amazon Echo: This smart speaker named Alexa is such a great gift for someone who is into technology and loves to have the latest new toys in the industry. Such great sounds quality and you can choose your color. 3. Baby Hand Print Kit: If you have a new baby this is such a great gift for your in laws from you and your little one. You can personalize with a sweet photo or letter and you can create the hand or foot print to go with it easily. We gave these to both grandparents last year and they loved it. 4. iRobot Roomba: You cannot go wrong with this gift. Your in laws probably hate vacuuming and this robot vacuum saves so much time and can run while you are away. I do not know what we would do without our Roomba. Life changing! 5. Shutterfly Photo Book: Did you take a trip this year with your in laws? This is a great gift to give them, you can create it easily online with any fun photos of your choice. Everyone loves custom gifts. Its so easy to make and there are always amazing discount coupons out there for Shutterfly. 6. DeLonghi Espresso Machine: This is a great espresso machine. Perfect gift for the coffee lover. It is a reasonable price and has great reviews. This gift is bound to impress the coffee loving in laws. 7. Nix Advance Digital Photo Frame: This is the perfect gift because it is sentimental and so easy to use. It is motion censored and it does photos and video. Such a fun gift that anyone would love. 8. California Wine Club Membership: This is the perfect gift for the wine lover. Great idea for anyone who love to try our different wines. They have several different wine club series, all different price points to choose from. Great way to try out new wine from different wineries. 9. Aervana One Touch Wine Aerator: This little gadget aerates your wine in one easy step. Once you open a bottle of wine you just pop the aerator on and attach. Every time you have a glass of wine you just hit the button and you are good to go. Life changing! 10. Handmade Gift Basket from World Market: Go to World Market and put together a gift basket of favorites for your loved one. They sell gift basket kits there that include the basket, the filler, plastic wrap, a ribbon, and a small card. All included. Shop around the store and pick out unique food, drink, decor gifts that they would love to include inside your basket.